The Nantwich Riverside Project was originally set in motion by Lucy Burton of the Mersey Basin Campaign and Officers at Crewe and Nantwich Borough Council. The project has now reached the end of its first year. Please see attached summary report for all the wonderful goings on in 2006. 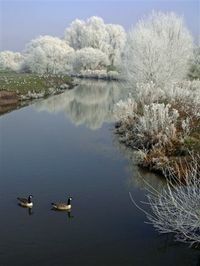 The Weaver in Winter - Courtesy of John Austin, Riverside Concern. Can you help the Godwit Patrol? A round-the-clock nest protection operation is ready to swing into action this spring when one of the UK’s rarest birds returns to nest on the Ribble Estuary, but more volunteers are needed. Black-tailed godwits are a tall elegant wading bird whose numbers are threatened across Europe, due to loss of its natural nesting habitat and persecution by egg collectors. Less than 60 pairs of the long-legged wading birds breed in the whole of the UK and the two pairs on the Ribble are the only ones to nest in the North West. When the birds return the RSPB and Fylde Bird Club will mount a 24-hour guard on the nests. If you can help please go along to the Ribble Discovery Centre, Fairhaven Lake, St Annes at 7pm on Thursday 5 April 2007. Alternatively, contact Carol Coupe on 01995 642251 or e-mail carol.coupe@rspb.org.uk. 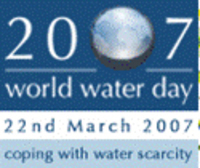 'Coping with Water Scarcity' is the theme for World Water Day 2007, which is celebrated each year on 22 March. This year's theme highlights the increasing significance of water scarcity worldwide and the need for increased integration and cooperation to ensure sustainable, efficient and equitable management of scarce water resources, both at international and local levels. Please visit the UN Water web site, and the UN Water for Life Decade web site for the latest information on UN freshwater programmes. How can you help? Nationwide Building Society have developed the Awards for Voluntary Endeavour with charity partners including the Heritage Lottery Fund, and are celebrating the tenth year of the awards this year. Entry is open to anyone under and over 18, whose voluntary work or community activity has made a significant contribution to their community. This can include work for charities, community groups or other organisations providing a valuable community service. The deadline for nominations is 30th April 2007.